In 1935 the Sportster was certified with a 70 HP LeBlond engine. Over 30 copies were built. Along with the Porterfield's, and Taylor's of the same era, to my eye, this airplane defines the American light-plane. 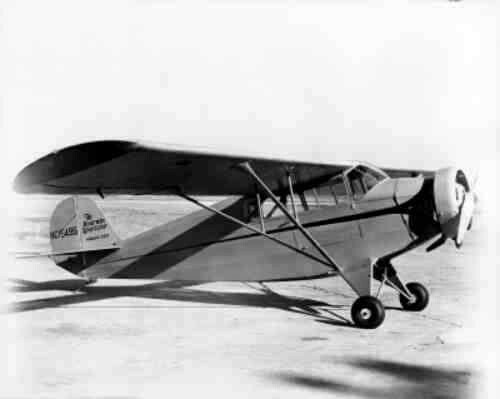 It went on to be produced with an NACA cowling, and a Ken-Royce radial engine. Collector Ring, Altimeter, Tachometer, Oil Pressure Gauge, Oil Temperature Gauge, Switch, Two Fuel Gauges, Fire Extinguisher, First Aid Kit, Cabin Door Lock -- Yale Type, Luggage Compartment (50 lbs capacity), Dual Controls, Hydraulic Landing Gear, Wired for Navigation Lights, Safety Belts, Fuselage Lining, Cushions and Seat Backs. Goodyear 18x8x3 Wheels and Brakes or Bendix Wheels and Brakes with General Streamline Tires, Navigation Lights, Speed Ring, Battery, Carburettor Heater, Tail Wheel, Special Instruments.